There are experiments done based on research done on the brain. For example there is a group involved in something called The Global Consciousness Project, which researches the many states people are in thought the world, trying to find connections between the different states of consciousness. Different thoughts and emotions provide different outputs of energy, which is measured to find different descriptors of what consciousness can be. A thought experiment called Schrödinger’s Cat, tries to measure the state of the object when it is in suspended animation. The observer has to make the call is the object, in this case a cat) is dead or alive when the box with the cat inside is exposed to the observer. There is argument whether this observation is a true measurement of the cat’s state, because the cat, if it survives, thinks he was completely alive the whole time however to the outside observer the animal looked dead. Roger Penrose brings the third culture into this topic, which is a valid observation. He talks about how measuring something in relation to consciousness has to be with something more than just numbers, which would involve not only scientific thought but artistic input as well. Brockman, John. "The Third Culture - Chapter 14." The Third Culture - Chapter 14. Simon & Schuster, 1995. Web. 14 May 2016. <https://www.edge.org/documents/ThirdCulture/v-Ch.14.html>. Frazzetto, Giovanni, and Suzanne Anker. "Neuroculture." Nature Reviews Neuroscience Nat Rev Neurosci 10.11 (2009): 815-21. Web. "The Global Consciousness Project." Global Consciousness Project: Introduction. Web. 14 May 2016. <http://noosphere.princeton.edu/gcpintro.html>. Vankin, Deborah. 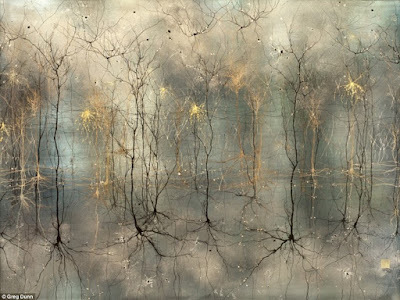 "Todd Carpenter on Art, Neuroscience and Seeing the Light." Los Angeles Times. Los Angeles Times, 28 Aug. 2015. Web. 14 May 2016. Vesna, Victoria. "Unit 7 Veiw." UC Online. Web. 14 May 2016. "Schrödinger's Cat." Wikipedia. Wikimedia Foundation, Web. 14 May 2016. <https://en.wikipedia.org/wiki/Schrödinger's_cat>. Woollaston, Victoria. "A Beautiful Mind: Japanese-style Art Inspired by Neuroscience Reveals Grey Matter in Much More Colourful Glory." Mail Online. Associated Newspapers, 15 Dec. 2014. Web. 14 May 2016.